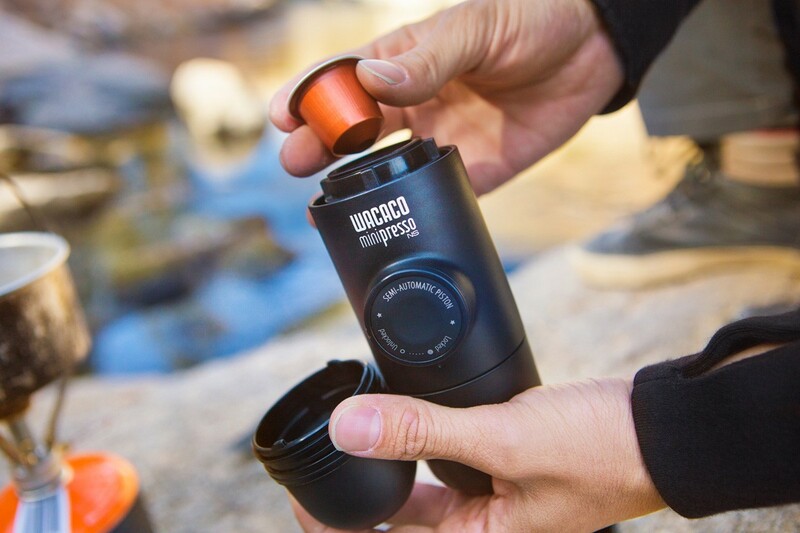 I don't think I have seen these mentioned before but interested if anyone is using one of these Wacaco Minipresso portable espresso machines? I could cope with one of the pod versions I reckon for a half decent coffee in the morning. A quick search found the Nesspresso version locally for $54.00. Hmm quite long, 350grams and pods to be rid of... I suppose tho' if you are carrying a chunky rucksack and a bit of weight, you wouldn't even notice this in there. I believe this (or something like it) has has come up on BW.com before. If you have milk (powder) with your coffee in the morning (and any other time) the one I linked (somewhere on here ?) for about $20 which is smaller lighter and cheaper, would suffice easily. For short black lovers -the Coffee looks alright tho'! I don't know any other short black lovers, everyone seems to drown their coffee in milk. I've got one, and use it with grounds. Even with the larger reservoir, it's still only a small cup of coffee, and there's a fair bit of fluffing around making it. I'm back to cowboy coffee in the bush ( grounds chucked in to billy of boiling water, taken off heat, stirred, left to sit for a few minutes, pot hit with spoon to precipitate grounds out on bottom, then slowly and carefully decanted). Much easier. andrewa wrote: I'm back to cowboy coffee in the bush ( grounds chucked in to billy of boiling water, taken off heat, stirred, left to sit for a few minutes, pot hit with spoon to precipitate grounds out on bottom, then slowly and carefully decanted). Much easier. What's a rough guide on how much coffee to use for this method to make a strong cuppa? More than what you'd put in the home espresso for a cup? You can get metal reusable filters- no use of pods - fab coffee- I should know, I live in Melbourne! Been using the non pod minipresso for a year now. Its uses ground and it makes a great espresso creme and all!! Had my non-pod minipresso for 2 years. Make a good, but very small, espresso. I preheat the unit with hot water before making the coffee. I have a nanopresso and a Aeropress and for hiking I would take Areopress but if I want espresso on a picnic, the nanopresso is AWESOME!